On July 8th, the performance at the former school assembly hall resembles a construction site, a derelict institution and disaster zone; gallery stud walls are toppled and abandoned, exhibition furniture re-purposed to serve as staging and support structures to found materials and purpose-made objects. Vorisek, positioned at the centre of this ruin, manipulates a soundtrack borne from contact mics affixed to mushroom-shaped metal objects. Feedback is modulated through chains of effects whilst sirens further disorientate the viewer. Spot lights positioned at floor level exaggerate shadows and a programmable LED light-bulb suspended from above is set to a red hue. Water inside a welded steel trough part submerges metallic ephemera and sound frequencies materialise via spectral ripples across the liquid surface. A spray can of magicians dry-ice evokes tacky showmanship, reinforced through the cheap shiny fabrics, with spiral and crescent shapes further adorning the overall composition that unfold as the aforementioned quasi-sonic and spectral situations. The exhibition in the gallery meanwhile takes a different tack. Stripped back and featuring a series of self-contained and clearly delineated works, it nevertheless reverberates with the performance-scape as its inverted counterpoint. The front space features two works; firstly a wall work entitled “Chosen From The Dead By The Traveler’s Ghosts” consisting of two wall-mounted speakers, crudely rendered in fabric strewn MDF panels with speakers attached to the reverse. A looped soundtrack of varying intensity plays throughout the day. On the floor a continuation of Vorisek’s ‘trip-wire’ pieces is arranged. “Mental skyline” is a linear assemblage of chains, springs, hooks and beads all tuned under tension, essentially functioning as a readymade performed or activated by visitors who inadvertently stumble upon the work when traversing the exhibition. In the rear space two latex-cast works “((( & )))” repel each other across the gallery corner. On the floor is the large steel trough that featured in the performance - “Repurposed, Burst City Archived” (2017) operates as back up and reciprocal echo container. Burst City is Jan Vorisek's (born Switzerland, 1987) second solo offering at TG, following his 2015 performance and installation Dreams & Buildings. Vorisek lives and works in Zurich. Recent solo presentations include Total Fragmented Darkness, Hard Hat (2017, Geneva); NotFair, Galerie Bernhard (2016, Warsaw); Rented Bodies, Galerie Bernhard (2015, Zurich). He has shown in group exhibitions including at Kunsthalle Exnergasse (Vienna 2017 ); Plato Ostrava (Ostrava 2017); Kunstverein Braunschweig (2017); Kunsthalle St.Gallen (2016); 83 Pittstreet (New York 2016); Espace Aurlaud (Lausanne 2016 Lausanne) and Kunsthaus Glarus (2016). Recent performances include Spring Workshop (Hong Kong 2016);Luma Foundation (Zurich 2016, Zurich);Cave12 (Geneva 2016, with Timotheé Calame); TG (Nottingham, 2015); Kunsthalle Zurich (2015). Together with Mathis Altmann and Lhaga Koondhor Vorisek has been organizing a series of club nights called HOUSE OF MIXED EMOTIONS or in short H.O.M.E since 2011. All performance images & video taken by Reece Straw. 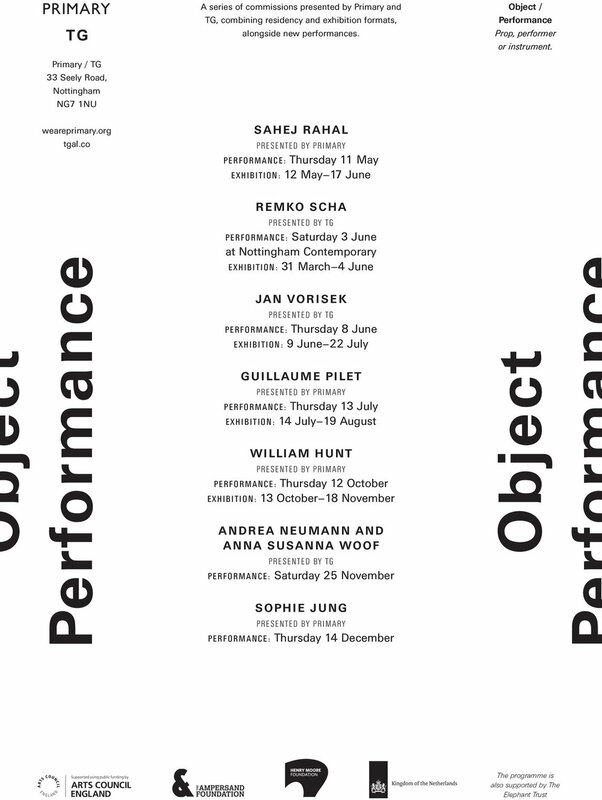 The Burst City performance forms part of Object Performance, a series of commissions presented by TG & Primary, combining residency and exhibition formats, alongside new performances. TG has previously presented a performance by Remko Scha's The Machines and will present a performance by Andrea Neumann & Anna Susanna Woof in November 2017.